It’s hard to believe another week has flown by! I think the shock of culture of shock is finally dulling into the gradual acceleration of familiar time… punctuated by new Chinese vocabulary words, meeting new friends, and trying to balance maintaining a lifestyle with exploring a new place! 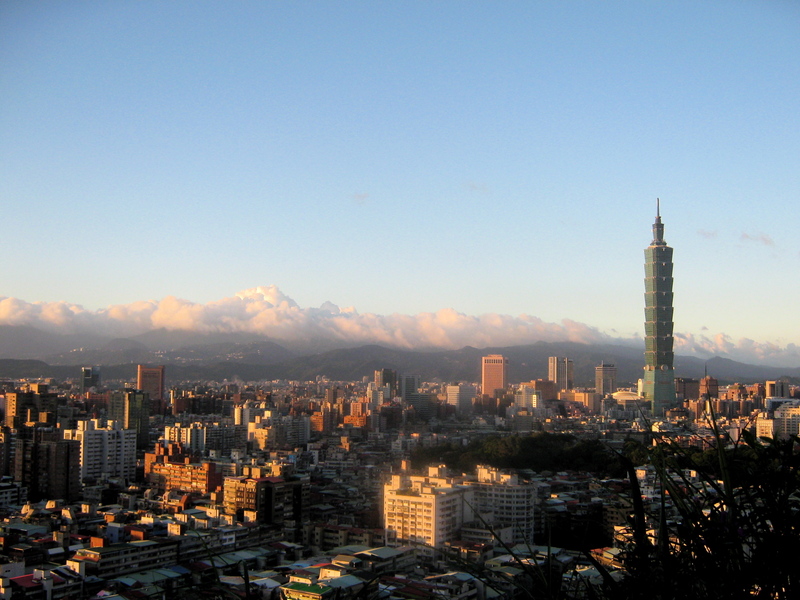 I am starting to get the urge to travel around our beautiful island of Formosa in an upcoming weekend, but this week, I satisfied my wanderlust by climbing a local “small mountain park” near my apartment, braving the wilds of the Zheng Da library, and seeking out an American style weekend brunch. 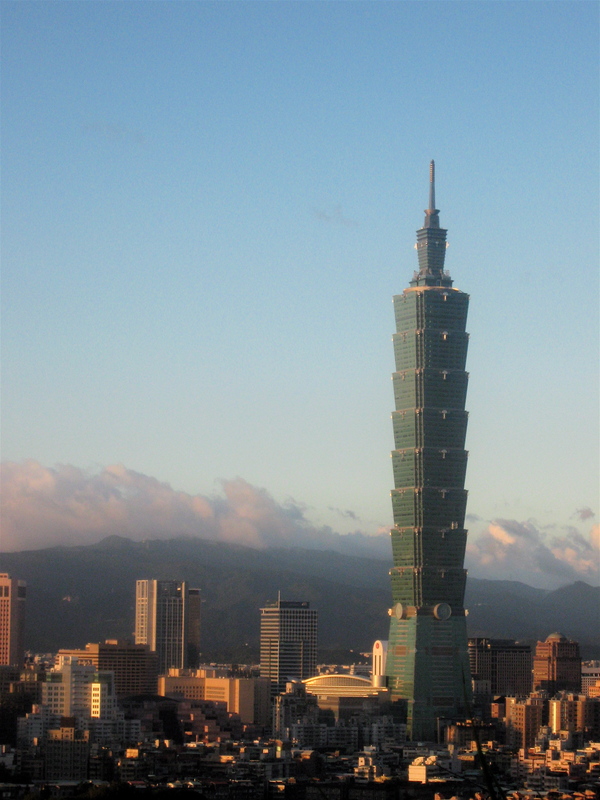 You have not paid your expat in Taipei dues until you've photographed Taipei 101 in a glamour shot and posted it on the internet. Can check that one off the list! 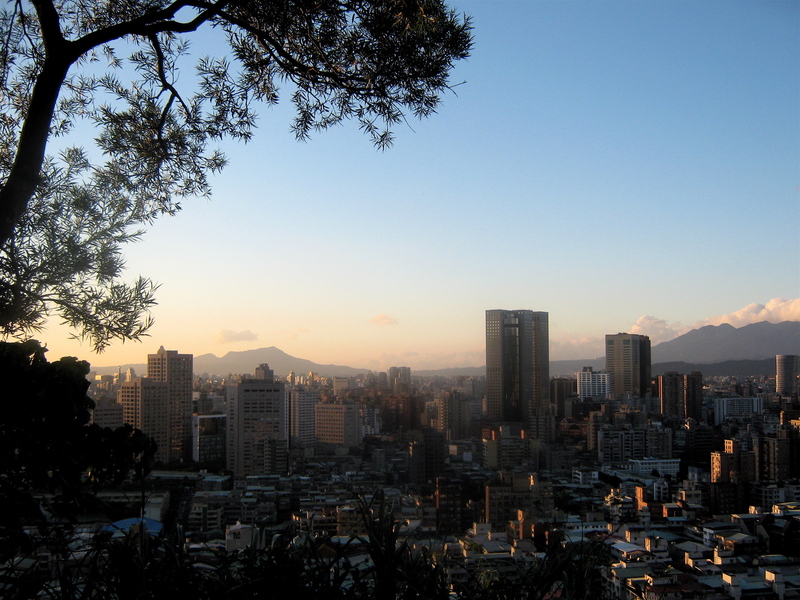 Some finds included: a gorgeous view of Taipei from the top of Fujoushan park, a whole collection of books in English on the 4th floor of the main library at Zheng Da, including the first volume of the recently published collected letters of Samuel Beckett (!!!!! 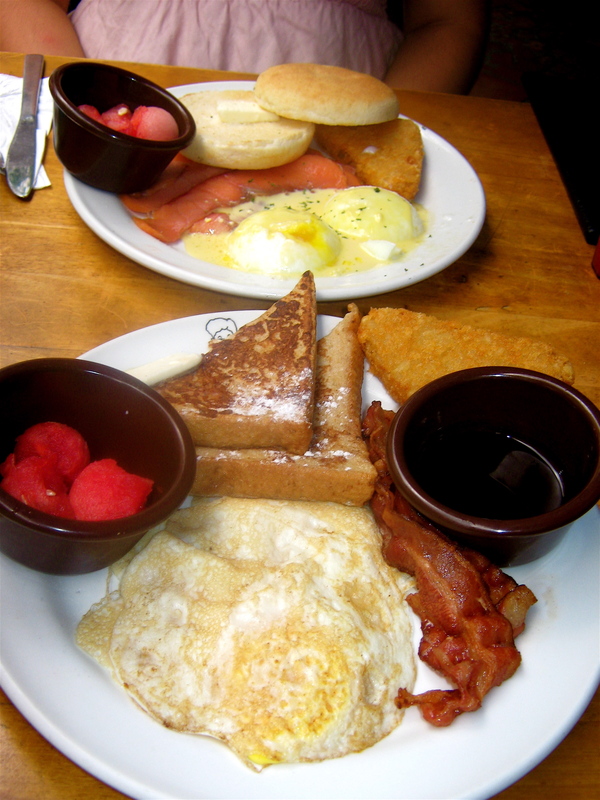 ), and a plate full of eggs, bacon, and hash browns! 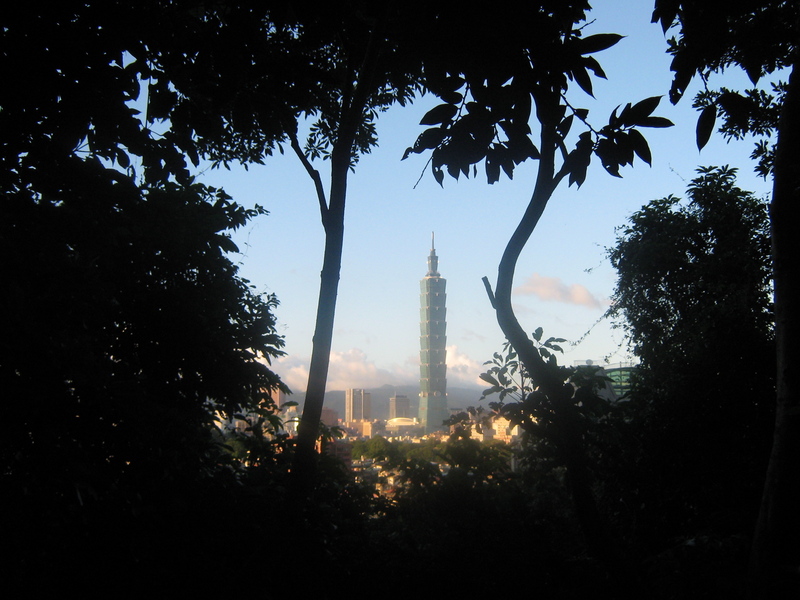 A view of Taipei 101 through the trees, on the way up to the top. It felt like a fairy tale, with the spires of a futuristic castle out in the distance. Those of you who know me well will also know that I am not quite sure which made me happier– Beckett or brunch. In my undergrad years, I took my first independent academic research voyage with good old Sam, to the inner sanctum of a play called Endgame. The research took me to Reading, England, where I pored over historical materials at the largest Beckett archive in the world, and basically cemented my past, present and future as a huge research nerd. The best part is that this is just the first volume of letters: 1929-1940. Stay tuned for the size of the volumes that encapsulate the other 49 years of Beckett's letter writing! I think back on Beckett so fondly, not simply because I love reading and seeing his plays, but also because my honors thesis was my first long form piece of researched writing. 100 pages later, I had proven to myself that I could set out a writing mission, and slowly chip away at it until I was if not satisfied, then briefly mollified by the “prolonged creative effort.” I’ll always think of Beckett as a familiar place where I mentally call home, an inspiration in spirit if not a model in form (I kind of believe that no one should try to “write like Beckett” because it doesn’t make sense without all of the historical and philosophical underpinnings, and even then, the “sense” factor is highly debatable). Five years ago, I actually corresponded with one of the editors of this collection of letters, back when I was first setting up my research project and mistakenly thought that “The Letters of Samuel Beckett Project” was a public archive, not a collaborative book project. But Lois Overbeck was exceedingly kind to this bumbling young researcher– she assured me that the volumes of letters would be published in forthcoming years, and pointed me to some published isolated sets of letters. 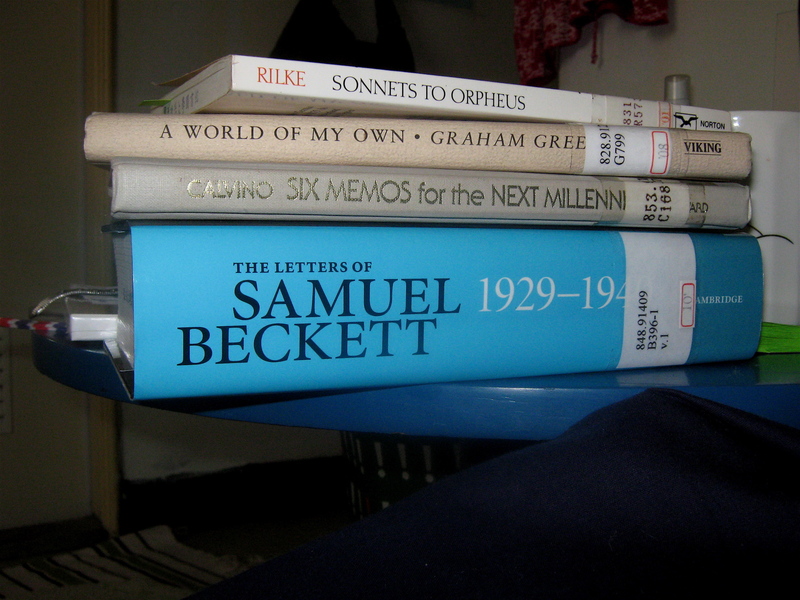 The initial letdown of not seeing Beckett’s letters actually helped me focus on the detail he gave to stage directions in staging his own plays in Berlin at the end of his life, so the story of the bumbling collegiate researcher ended happily– but I am still thrilled to finally crack open the long-awaited letters that I once sought out 5 years ago. To add to my stack of library books, I found two fascinating-sounding works of nonfiction by Calvino and Graham Greene, as well as Rilke’s “Sonnets to Orpheus.” It’s funny to me that in visiting my father’s family’s homeland, I would find such deep comfort in Western literature. But university libraries have been a kind of security blanket to me, ever since my freshman year at Stanford. I take great comfort in the maintenance of institutional knowledge, in the ability to happen across serendipitous accidental research discoveries; I enjoy the energy built by a collective buzzing of brains in and around books. Just knowing that the 4th floor of Zheng Da’s library is there for me if I need to run my fingers over some ancient book spines is a great feeling of comfort. Brunch mission accomplished at Grandma Nitti's, an American-style restaurant mere steps from the Shi Da night market, and near both Tai Da and Shi Da universities. My plate: eggs, bacon, "hash" browns, "french" toast, and watermelon. My friend's plate: (deconstructed) eggs benedict with smoked salmon, hash browns, and watermelon. Yum! At brunch, the bacon tasted pretty great too– almost as good as the Beckett. 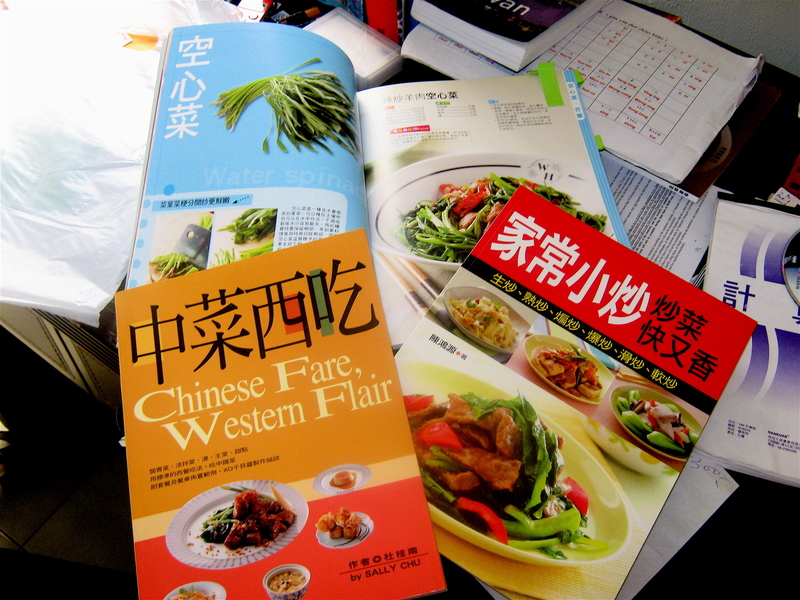 Meals in a different language are more of a “brunch challenge” than I want to take on! And I agree, reading in English is such a wonderful safe place when you’re so far away from home. I remember reading the first “Rabbit” book by Updike in Thailand (the two will be forever, oddly, and inextricably linked) and reveling in the American-ness of it all. Enjoy your Beckett (does he make sense in his letters?) and your bacon, too. Brunch was indeed delicious, and I’m looking forward to more adventures in Taiwan. I’m sure they will involve quite a lot of English book-swapping.